There are 76 Assisted Living Facilities in the Keego Harbor area, with 1 in Keego Harbor and 75 nearby. The average cost of assisted living in Keego Harbor is $2,500 per month. This is lower than the national median of $3,346. Cheaper nearby regions include Pontiac with an average starting cost of $2,125. To help you with your search, browse the 404 reviews below for assisted living facilities in Keego Harbor. On average, consumers rate assisted living in Keego Harbor 4.3 out of 5 stars. Better rated regions include West Bloomfield with an average rating of 4.5 out of 5 stars. Caring.com has helped thousands of families find high-quality senior care. To speak with one of our Family Advisors about assisted living options and costs in Keego Harbor, call (855) 863-8283. Keego Harbor is located in Oakland County, Michigan. It is nestled between Cass Lake and Sylvan Lake and features beautiful waterfront views and resort homes. Keego Harbor is located approximately 30 miles north of Detroit and is home to just over 1.25 million residents, 16.7 percent of whom are over 65 years of age. Throughout the state of Michigan, communities that provide assisted living services to the elderly are known as homes for the aged. There is one home for the aged in Keego Harbor, and an additional 63 in surrounding areas such as Pontiac, Auburn Hills and Waterford. Seniors living in Keego Harbor can feel assured knowing that the local air quality will not aggravate underlying lung-related medical conditions, as it has been given a passing grade by the American Lung Association. There is an array of community resources available to seniors in the Keego Harbor area, including C.A.T.S., a program that gives seniors throughout the county the opportunity to adopt a pet, as well as one senior center. Keego Harbor has few facilities to choose from in the event of medical emergencies or illness, with the nearest major hospital in West Bloomfield. SmartBus provides seniors with a safe door-to-door transportation option throughout Keego Harbor and surrounding areas. Although the overall cost of living in Keego Harbor is 9.3 percent above the countrywide average, seniors on a budget can save on expenses such as healthcare, which is 17 percent below the national average. Seniors who are working with a smaller budget can also save money on income tax while living in Keego Harbor. The state of Michigan does not tax social security income and all other forms of retirement income are subject to reduced income tax rates. Assisted Living costs in Keego Harbor start around $2,500 per month on average, while the nationwide average cost of assisted living is $4,000 per month, according to the latest figures from Genworth’s Cost of Care Survey. It’s important to note that assisted living rates in Keego Harbor and the surrounding suburbs can vary widely based on factors such as location, the level of care needed, apartment size and the types of amenities offered at each community. 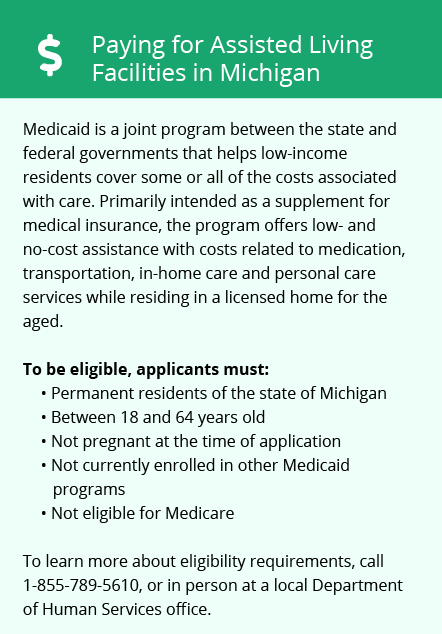 Seniors living in a home for the aged in Keego Harbor can apply for financial assistance under Michigan's Medicaid State Plan, which pays for the cost of assisted living services. Supplemental Security Income recipients who require additional assistance paying for room and board can apply for an optional state supplement. Keego Harbor and the surrounding area are home to numerous government agencies and non-profit organizations offering help for seniors searching for or currently residing in an assisted living community. These organizations can also provide assistance in a number of other eldercare services such as geriatric care management, elder law advice, estate planning, finding home care and health and wellness programs. To see a list of free assisted living resources in Keego Harbor, please visit our Assisted Living in Michigan page. Keego Harbor-area assisted living communities must adhere to the comprehensive set of state laws and regulations that all assisted living communities in Michigan are required to follow. 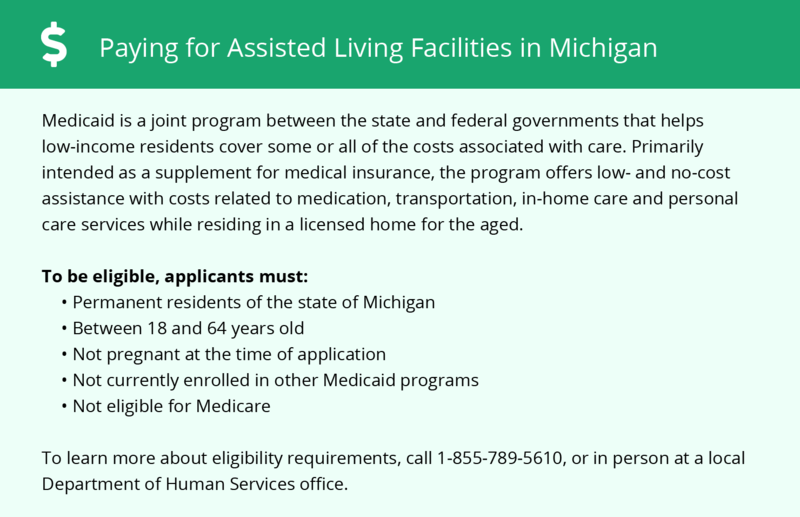 Visit our Assisted Living in Michigan page for more information about these laws.